20 Full-size starburst patterns that are only 6” to 7.5” in diameter. Can use any combination of your favorite glass colors and textures in these easy-to-create window hangings. 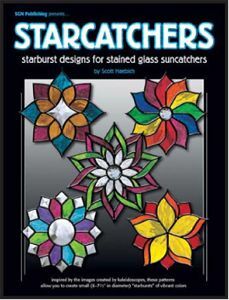 Rather than filling up a window with one large Starburst, you can hang several of these smaller Starcatchers to liven up a room. They also make great gift items. Includes: 20 Patterns, 6" to 7.5" diameter, kaleidoscope images.